SINN FÉIN has asked republicans to consider "transitional arrangements" on Irish reunification including the continued existence of the devolved administration in Belfast. In a speech on Saturday at the Corrymeela peace and reconciliation centre in Co Antrim Sinn Féin MEP Matt Carthy said supporters of Irish unity should be "open, imaginative and accommodating". He called for republicans and nationalists to consider new thinking on the shape of any reunified Ireland, including "transitional arrangements which could perhaps mean continued devolution to Belfast within an all-Ireland structure". Mr Carthy, who is head of Sinn Féin's United Ireland Strategy Group, said there would be a "democratic imperative" for a poll on Irish unity if the UK opted to leave the European Union in the referendum planned for later this month. But it is understood that his call for a rethink on the shape of a united Ireland is to be interpreted as new language by Sinn Féin and follows comments last year by party president Gerry Adams that Irish unity may not be the version "traditionally envisaged". Mr Carthy told the event which included speakers from the DUP and Ulster Unionist Party that, as a result of unionist opposition to constitutional change, republicans needed to be "open, imaginative and accommodating in our approach to bringing about a united Ireland". He said: "For instance, I think we need to consider transitional arrangements which could perhaps mean continued devolution to Belfast within an all-Ireland structure. "What else could it mean? Why don’t we have some discussions about that?" It is understood the phrase "continued devolution to Belfast" imagines an Assembly covering the six counties that currently make up Northern Ireland. He added that the "historical trajectory is for the coming together of Orange and Green", saying: "To those who say that this will not happen, it is worth noting that it is only a few short years since the idea of the Democratic Unionist Party and Sinn Féin being in government together would have been regarded as absurd. Yet this has happened." The speech builds on previous remarks by the Sinn Féin leadership, but it is understood to be a signal that the party now wants to open up a discussion on alternative visions for the future. Mr Carthy said: "The only type of United Ireland that interests me is one that is agreed, inclusive, pluralist and which is constructed by all our citizens, from whatever background or tradition." He said that the republican ideals of the 1916 Easter Rising had not been achieved on either side of the Irish border. "The financial crash and its aftermath has politically educated an entire generation of people in Ireland," he said. "There is now an urgency among many young and not so young people to confront the shibboleths, hypocrisy and cant of the past and to build a much more open, progressive and equal society." 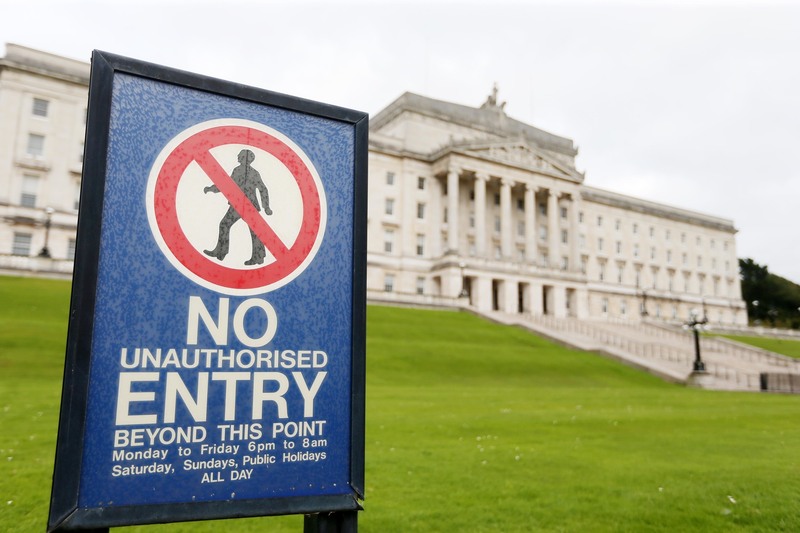 DEBATES on Irish reunification have recently centred on opinion polls that showed little expectation that the Irish border will disappear any time soon. But that effectively stifled discussion. As a result there has been little consideration given to demographic shifts in Northern Ireland that have seen the decrease of the Protestant/unionist majority. Northern Ireland was founded in 1921 with a population that was 66% Protestant and 34% Catholic, but by the census of 2011 that had changed to 48% Protestant and 45% Catholic, with predictions that the Catholic/nationalist population is set to grow. As reported here, the change coincided with political upheaval in Britain, including the rise of the pro-independence Scottish National Party, plus tensions in Westminster politics that led to the EU referendum. Recent years have also seen Sinn Féin emerge as a mainstream party in the Irish republic, where the political landscape has been transformed by the fallout from the economic crash. Meanwhile, within Northern Ireland the DUP and Sinn Féin have come to dominate the power-sharing government at Stormont. Despite these developments Sinn Féin is still chasing a breakthrough moment - as was reported here - though it continues to pursue its aim of reaching government in both Belfast and Dublin. Sinn Féin's shift in language on Irish unity follows previous indications that a pragmatic approach was to be announced. In September 2015 at an event in Dublin attended by British ambassador to Ireland Dominick Chilcott, Gerry Adams said a reunified Ireland may not match the image that is "traditionally envisaged." In an earlier interview here with the The Detail published in March 2013 Mr Adams asked the question "What is Irish unity? ", signalling new thinking was on the way in Sinn Féin. Unionists in Northern Ireland have also called for new ideas to ensure the union with Britain is maintained. The traditional version of Irish unity pursued by republicans throughout the 20th century seems unlikely in the foreseeable future. But The Detail previously examined here how other constitutional options may emerge in the event of continued political change. It has been claimed that London and Dublin might eventually share sovereignty for Northern Ireland in a form of joint authority giving full equality to the British and Irish traditions. That could fit within the political structures that are already enshrined in the 1998 Good Friday Agreement which protect both nationalist and unionist communities. Sinn Féin hasn't mentioned joint authority or other specific models. But it is significant that it is imagining a future which includes the current devolved government at Stormont "within an all-Ireland structure". Political, demographic and social change suggests that both unionism and republicanism will have to be innovative in the time head. The DUP is in a strong position but has recognised the need to constantly rethink its strategies, while Sinn Féin's Corrymeela speech appears to be the beginning of a new phase for republicans. Sinn Féin's critics will say the party is lowering its expectations, but Sinn Féin will argue that it is seeking to plot a realistic path towards its goals. It seems that republicans are trying to keep the constitutional debate alive by changing the question. Loughinisland, Kingsmill, Ulster Resistance, Stakeknife - how will government react to reminders of the violent past?